Say: Come, I will recite unto you that which your Lord hath forbidden to you; that ye ascribe nothing as partner unto Him and that ye do good to parents, and that ye slay not your children because of penury. We provide for you and for them. Qul ta-‘aa-law ‘atlu maa harrama Rabbukum ‘alay-kum ‘allaa tush-rikuu biHii shay-‘anw-wa bil-waali-dayni ‘ihsaanaa. Wa laa taq-tuluuu ‘awlaada-kum-min ‘imlaaq. Nahnu Narzuqu-kum wa ‘iyyaa-hum. Ta-‘aa-law – (Come, you should come), its origin is ta-‘aa-la, which has been derived from ta-‘aal and made from ‘uluw-wun. ‘Ulu means exaltation. Ta-‘aalaa means “to be exalted, to be at higher position. If any person is at a higher place; for example, at upper storey of a house or on any platform, and he calls someone from the lower place, then as per Arabic language, he will say ta-‘aa-la which means “Come up”. After that, use of the word Ta-‘aa-la “come” was begun for calling someone closer or to draw his attention. Here it aims “Be attentive, Attend to me”. We can say it also as “Listen to me or Come, I am going to relate you the commands”. Harrama – (forbade), it is in past tense, origin of which is Tahriim, which has been derived from haraam, one meaning of haraam is “forbidden”. Another meaning of this word is “the final and prescribed order” too. Here the word Tahriim has been used for the same meaning, that is to say; to prescribe, definite command. ‘Imlaaq – this word has been derived from malq, which means light, delicacy. ’Imlaaq means “to finish the money by spending, to be steeped in poverty”. It is the duty of humankind that he should obey the Orders of Allah Almighty. He should not impose any restriction himself upon himself. If he will do so, he will be called tyrant and cruel. In the previous Section, manifested Orders of Allah Almighty about food were described. In this Section, clear and final guidance has been given about the morality and affairs. Thoughts of human are based uncertainty and doubt, but the Commands of Allah Almighty are certain and decisive, in which there is no space of any doubts. It is commanded: Come, I will recite you the works, which Allah Almighty has determined for you for doing. 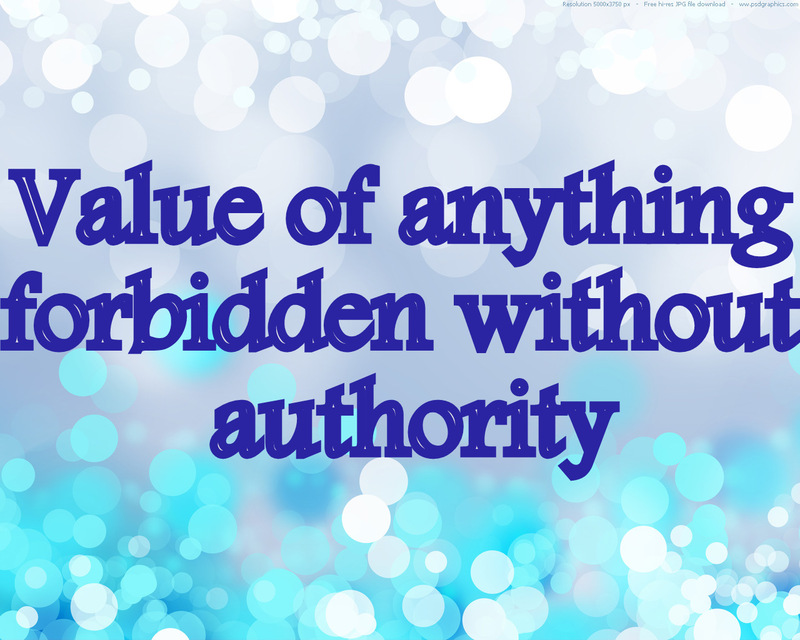 It is your duty that you should adhere to His Orders, and should not make rules yourself according to your will. Making law is not your job. It is the work of only Allah Almighty. You should not ascribe any partner with Allah Himself and His Attributes. You should do good with your parents. You should never kill your children due to the reason that by bringing them up, your wealth will finish and the penury will spread over. 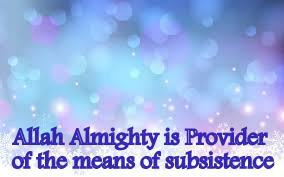 As Allah Almighty provides you the means of subsistence, in the same manner, He will provide them food also. Many traditions were in force against the humanity in Arabian territory. Idols were worshipped, and those people used to consider the idols a source to reach Allah. They used to kill their children considering that while they did not have food for themselves, then how they would provide them? Say: Come, bring your witnesses who can bear witness that Allah forbade (all) this. Then if they bear witness, do not thou bear witness with them. And follow thou not the whims of those who deny Our Revelations, and those who believe not in the Hereafter and deem (others) equal with their Lord. Qul halumma shuhadaaa-‘akumul-laziina yash-haduuna ‘annAllaaha harrama haazaa. Fa-‘in shahiduu falaa tash-had ma-‘ahum. Wa laa tatta-bi’- ‘ahwaaa- ‘allaziina kazzabuu bi- ‘AayaatiNaa wal-laziina laa yu’-minuuna bil- ‘Aakhirati wa hum- bi-Rabbihim ya’-diluun. Halumma – (Come, bring), this word is a noun, which has been used as the meaning of “the Command”. There are some such words in Arabic language, which are Noun, but their meanings are of “act of command” or the past. Such words are called verbs of noun. It has been told in the previous verse that they should bring forth any proof regarding those things, which they have predetermined forbidden. Obviously they have no argument except it that they make only random talks. It has been commanded in this verse that certainly, they have no proof. So now, if they have any such witness, then they should come and bring him forth, who may say: Yes! I was present at that time, when Allah Almighty forbade these things. Apparently; they do not have such witnesses too. Suppose! If they produced such witnesses due to their prestige or giving a bribe, then certainly they would be liars, even then you should neither be agree and nor accept it. Now because, neither they have any witness, nor argument, so it is clear that they follow only their desires and do, whatever they wish to do. You do not have any desire to follow their wills and do as they say. You should never acknowledge the superiority of such people, who try to falsify the Revelations of Allah Almighty. They do not believe in the Day of Resurrection and deem others equal with their Lord Almighty. We have come to know a very useful matter from this verse, and a necessary issue has been finalized from it, that is to say; we should not obey such people, who do neither belief in the Noble Qur’an with true heart, nor have faith in the Doomsday, and those, who give importance and priority to others and their sayings, equal to God Almighty, but more than Him. If (God forbid), there are such people among the Muslims, then they do not have any authority to make laws and legal decisions. They are not worthy of making laws or deciding the religious cases. 148b. Say: Have ye any knowledge then bring it forth to Us? Lo! ye follow naught but an opinion, and lo! ye do but guess. 149. Say: For Allah’s is the Final Argument. Had He willed He would indeed have guided all of you. 148b. Qul hal ‘indakum-min ‘ilmin-fatukhrijuuhu laNaa. ‘In- tattabi-‘uuna ‘illaz-zanna wa ‘in ‘antum ‘illaa takh-rusuun. 149. Qul fa-LIllaahil-Huj-jatul Baaligah. Falaw shaaa-‘a lahadaakum ‘ajma-‘iin. ‘Ilm – (to know, the knowledge), here it aims such decision, due to which, the heart is satisfied, whether its sources are logical arguments or experience etc. Tukhrijuuhu – (Bring it forth), actually this word is tukhrijuun. After the “question”, use of alphabetical letter “Fa” became the reason to delete the last letter “n”. Its origin is ‘akhraaj, which has been derived from kharuuj. Kharuuj means “to come out, to appear”. ‘Akhraaj means “to draw out, to disclose”. Zann – such decision, which may not satisfy the heart, because that has not still been proved by argument or experience, but it is hoped that it would be sound. Takh-rusuun – (they guess), this word is from khars, which means “to guess, to conjecture”. Neither it is guaranteed nor suspected. We can say it “a wild guess, a random talk”. Huj-jatul Baaligah – (the Final Argument), such argument, with which the claim is proved, is called Hujjat. ‘Al-Baaligah Is from the word Balogh, which means “to reach the limit”. ‘Al-Baaligah means “complete, reached the limit, in which, common sense would not have any doubt”. It has been described clearly in this verse that the matters regarding talking as: Nobody has any certain proof and absolute authority to say that the calamities of the world do not belong to the evil deeds of the humankind, and the Wrath and Reward are nothing. The will of those people seems them proof, who are enthusiasts of their wishes. Contrary to them, that word is true absolutely, which is recommended by Allah Almighty and His Messenger (grace, glory, blessings and peace be upon Him). Their Argument is so matured that the hearts accrue perfect belief and complete satisfaction. And the sense of such people, who are not slaves of their carnal desires, accepts it forthwith. It is commanded that You should tell them: Bring that decisive argument forth to Us, if you have any, that the wrath does not come due to evil deeds. 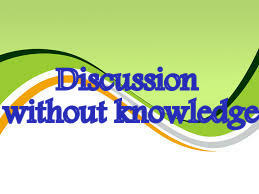 Otherwise, it is open that your entire conversation in this matter is only a conjecture. That, which Allah Almighty has commanded, has very strong argument. 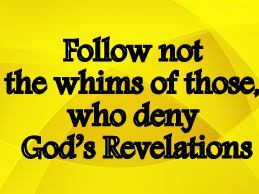 That wisdom of human, which has the Light of Revelation, accepts this Final Argument immediately. And the conscience of every human being is witness upon it personally, on the condition that, it would not have become useless being under the material burden. Allah Almighty desires to enforce the humankind that he should accept the Truth by this Final Argument; otherwise, it was not difficult for Him to guide thus the entire people. They who are idolaters will say: Had Allah willed, we had not ascribed (unto Him) partners neither had our fathers, nor had we forbidden aught. Thus did those who were before them give the lie (to Allah’s Messengers) till they tasted of Our punishment. Sa-yaquu-lullaziina ‘ashrakuu law shaaa-‘Allaahu maaa ‘ash-raknaa wa laaa ‘aabaaa-‘unaa wa laa harramnaa min shay. Kazaa-lika kazzabal-laziina min- qablihim hattaa zaaquu ba’-saNaa. It was understood from the previous verse that the Wrath of Allah Almighty is lurking always upon the heads of guilty people. The evildoer is saved for a few days, but for how long? His woe and ill-luck is mounted on the neck of entire nation. Whenever misdeeds become common in imitation of effectual and wealthy people then it should be understood that the nation is going towards the destruction. If neither it became cautious and nor anyone prevented the individuals from wicked-deeds, then the Wrath is beyond question. 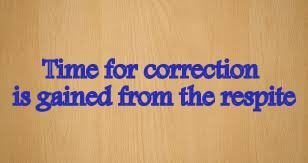 Coming not the Wrath forthwith, is also a Mercy, because the time for correction is gained from the respite. The same subject has been explained more clearly in this verse. It is commanded that these people, who associate others in worship and who are stuck in evils, will search the pretense of those deeds, which are against the humanity, that, which act they are committing, is the same as their fathers used to do. They say: If Allah had not liked these matters, He would have stopped us very earlier. That, which you say that we should give up all things as – thinking about other things leaving Allah, and fixing some things forbidden and some lawful without commands of Allah, how a wonderful is it? Tell us! How can we obey You? These acts have been being done since the times of our fore-fathers. Neither any of them was ruined and nor the wrath came. As reply to their absurd thoughts, Allah Almighty commanded that you should say to them: Such Wrath, which may destroy everything, has been held up due to the spacious Mercy of Allah Almighty. It is being postponed for the reason that perhaps; these evildoers become careful any time and give up evils, otherwise; the Wrath is ready every time for the guilty people. The Wrath have come upon the ancient people and they were ruined due to the adversity of their disobedience. They used to say also before coming of the Wrath that evil and sin is nothing. Continue committing whatever you wish. Wrath and punishment will never come. At last, the Wrath came and they were removed from the Home Page of the Existence. There is severe warning for us in this verse. We should understand it thoroughly that those deeds which have been forbidden in the Holy Qur’an and the evildoers have been frightened from their punishment; it is the time to give up them. This respite should be taken as a blessing. The earthquakes, storms, diseases and calamities, which use to come in the world, are meant that the humankind should leave disobeying the Commands of Allah Almighty, having fear of His Wrath, because human being has no control over the earthquakes and the storms. Certainly the experience of mankind has increased, but mostly he can describe only the causes of these calamities from it, he is unable to challenge them. Saying that: These are the natural accidents, what interference of the acts of humankind is in the calamities? These are only their stupid sayings. So if they give the lie to Thee (Muhammad), say: Your Lord is a Lord of All-Embracing Mercy, and His Wrath will never be withdrawn from guilty folk. Fa-‘in- kazza-buuka faqur- Rabbukum Zuu- Rahmatinw-waasi-‘ah. Wa laa yuraddu ba’-suhuu ‘anil-qawmil-mujri-miin. It was described in the previous verse: We forbade the Jews from using of lawful things as award of their rebellion. When Messenger of Allah Almighty (grace, glory, blessings and peace be upon Him) said to the Children of Israel, they denied from it and said: These things have been coming forbidden since old times. 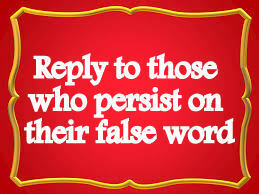 This saying of theirs has been confuted by Holy Qur’an, whereas they continued persisting on their word, though they could not bring any proof upon it. The people, who continue obstinately and firmly, while they know that they are at wrong, remain in this error that they will not be punished immediately. It has been replied in this verse. It is commanded here that if they give a lie to the Messenger (grace, glory, blessings and peace be upon Him), though there is no any other reason of falsifying than it that their heart does not desire to accept Your Saying. One more reason may be that they think; if they accept, they would be disgraced. Allah Almighty commands His Messenger (grace, glory, blessings and peace be upon Him): Say to them! You are liars and going to stay on the false and wrong. You are not punished immediately for wicked deeds because your Lord is a Lord of All-Embracing Mercy. He does not arrest the evildoer at once, but relaxes him. Moreover, it does not mean that you deem it, as, your behavior is correct and you are not guilty. Although Allah Almighty loosens the string of guilty but the guilty shall be punished certainly sooner or later, if he/she did not attend the Court of Allah Almighty and beg for forgiveness, for repenting due to his/her sin, because His Wrath will never be withdrawn from the guilty people. It is only His Mercy, Which has stopped him from punishing, that perhaps, the evildoer repent of own sins. When you see any disobedient of the Commands of Holy Qur’an happy, wealthy and vigorous, you should not suppose that proclamation of punishment and Wrath for the guilty people is only a warning, otherwise, what is its reason that the entire blessings are available for the sinners and they are enjoying their lives. Anyone of them suffers no injury. The guilty people shall be punished and the Wrath of Allah Almighty shall never be withdrawn from them. Being the punishment late is due to any other purpose, proper time of which is prescribed. That will not be ignored, when the time came. If any individual of a folk commits an evil, its burden falls on his/her entire nation. A time will come when the whole nation will be destroyed, if evil deeds of the individuals are increasing, because it is duty of the entire nation to stop the evildoers from committing. If the nation remained indolent from its duty, will be ruined at last. And unto those who are Jews We forbade every animal with claws. And of the cows and the sheep forbade We unto them the fat thereof save that upon the backs or the entrails, or that which is mixed with the bone. That We awarded them for their rebellion. And lo! We verily are Truthful. Wa ‘al-laziina haaduu harramNaa kulla zii-zufur. Wa minal-baqari wal-ganami haram-Naa ‘alay-him shuhuuma-humaaa ‘illaa maa hamalat zuhuuru-humaaa ‘awil-hawaayaaa ‘aw makh-talata bi-‘azm. Zaalika Jazay-Naahum- bi-bagyihim; wa ‘inNaa la-Saadiquun. Hawaayaaa – (the entrails), this word is plural of Hawiy-yah, which has been derived from Hawaaa. Hawaaa means “to surround, to envelope anything inside. Hawiy-yah is the thing, which is wrapped around with any other thing to hide in the wrapper. Here it aims “the entrails”, which cling with one another along-with the attachment of fat. This description is under discussion since previous verses that the individual, who believes that someone else has power to fix the things forbidden or legal, is an idolater. It is the basic concept of Islam that neither any person is empower and nor any other should be taken as he can determine the laws and rules for him/her, or he can make law for any field of his/her life except Allah Almighty. 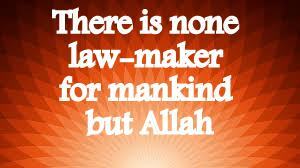 There is none Law-maker for humankind but Allah Almighty. The entire social, collective, economic and political laws are based on the Commands of Allah Almighty. That law, which has not been made on this foundation, will never be acceptable. 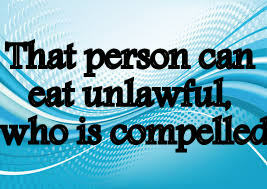 In this connection, it is to admonish that neither can you determine anything lawful and nor prohibited. Allah Almighty has prescribed the Rule that all the things are legal for human being except those which have been forbidden by Allah Almighty Himself. Those things were mentioned in the previous verse, which were forbidden for food or any other use. It has been described in this verse to explain about His (God’s) Power that He forbade the Jews from the use of some lawful things due to their disobedience and rebellion. It is commanded: We forbade every that animal unto the Children of Israel, which does not have the fingers separately from one another; for instance the camel, and the fat of the cows, goats and the sheep, but that fat of these cattle was not forbidden, which was upon their backs, bones or with the entrails, for the reason that they were mischievous and used to disobey Allah Almighty. Allah Almighty says: “Lo! We verily are Truthful”. This command of Allah Almighty is due to the purpose that the Jews used to say: These things were not forbidden for us only because of disobedience, but these have been coming forbidden with effect from the times of Prophets Noah and Abraham (peace be upon Them). This matter has been explained clearly in the beginning of Part – 4 (Lan Tanaaluu) of Holy Quran. Say: I find not in that which is revealed unto Me aught prohibited to an eater that he eat thereof, except it be carrion, or blood poured forth, or swine-flesh – for that verily is unclean – or the abomination which was immolated to the name of other than Allah. But whoso is compelled (thereto), neither craving nor transgressing, (for him) lo! Thy Lord is Forgiving, Merciful. Qul-laaa ‘ajidu fii maaa ‘uuhi-ya ‘i-layya muharraman ‘alaa taa-‘iminy-yat ‘amuhuuu ‘illaaa ‘any-yakuuna may-tatan ‘aw damam-mas-fuuhan ‘aw lahma khin-ziirin- fa-‘innahuu rijsun ‘aw fisqan ‘u-hilla ligay-RIllaahi bih. Famaniz-turra gayra baaginw-wa laa ‘aadin- fa-‘inna RabbaKa Gafuurur-Rahiim. Fisqun – (the abomination, against the Law and evil deeds), actually it means “going beyond the law and evildoing. Faasiq means evildoer, sinful. Here fisqan aims – that animal, which has been slaughtered invalidly. ‘U-hilla – (immolated, sacrificed, proclaimed and called aloud upon), it is past passive voice tense, origin of which is ‘ahlaal and made from – h-l-l, which means “to manifest, to appear”. The word hilaal has been derived from it, which means “the moon of the first night, which appears after three moon-less nights)”. ‘Ahlaal means “to call aloud and openly, to proclaim”. It aims “such animal, which either has been nominated to the name of any other than Allah or the name of any other than Allah was called aloud at the time of its sacrifice”. Baagin – (the disobedient), actually this word is baaghii, which has been derived from the word baghaawat. Bagaawat means “to disobey the order of someone. Here it aims “the disobedient of Allah Almighty”. The abomination which (the animal) is immolated to the name of any other than Allah Almighty i.e. any spiritual guide, idols or gods. Four forbidden things were discussed in the first Section of Chapter (Surah) ‘Al-Maa-‘idah. It is their detail. 144. And of the camels twain and of the cows twain. Say: Hath He forbidden the two males or the two females, or that which the wombs of the two females contain; or were ye by to witness when Allah commanded you (all) this? Then who doth greater wrong than he who devisheth a lie concerning Allah, that he may lead mankind astray without knowledge. Lo! Allah guideth not wrongdoing folk. 143b. Nabbi-‘uunii bi-‘ilmin ‘in- kuntum Saadiqiin. 144. Wa minal- ‘ibilis-nayni wa minal-baqaris-nayn. Qul ‘aaaz-zaka-rayni harrama ‘amil-‘unsa-yayni ‘ammash-tamalat ‘alayhi ‘arhaamul-‘unsa-yayn. ‘Am kuntum shuhadaaa-‘a ‘iz wassaa-kumUllaahu bi-haazaa. Faman ‘azlamu mimma-niftaraa ‘alAllaahi kaziballi-yuzillan -naasa bi-gayri ‘ilm. ‘InnAllaaha laa yahdil-qaw-maz-zaalimiin. Allah Almighty addressed His Messenger (grace, glory, blessings and peace be upon Him) that He should ask the idolaters, how they have come to know that these cattle are forbidden, because the knowledge needs authority. If they were true, then which Prophet or Messenger told them about this illegal-ness? Likewise; Allah Almighty created four in two pairs i.e. male and female camels, and of the cows twain. Ask them about these cattle also: Whether Allah Almighty has forbidden their males or females or those which are in the wombs of their females? Quote authority from any Scripture sent down by Allah Almighty, if any Prophet or Messenger (peace be upon Him) has told you. If not so, then expound to Me; were you present at that time when Allah Almighty had forbidden them and did you hear it with your own ears? If the matter is not as you say, then explain it: Who is more tyrant than that person, who calumniates falsely against the name of Allah Almighty and says about that thing that Allah Almighty has forbidden it, whereas that has not been forbidden by Him? Then it is commanded: While it has been proved through their tricks and wicked deeds that they are unjust in all respect and they do not have any ability to understand the truth and go Straight Path, then how can they be guided? Allah Almighty has determined this Rule that He does not guide them, who are not able to do well. Those people have been rejected very clearly in this verse, who make the things legal or forbidden upon themselves with their self-invented pretenses and tricks without any authority. And it has also come to know that there are two ways to obtain the certain knowledge; either any reliable person should tell, or the individual have to listen or see himself. Therefore, those Commands which exist in Holy Qur’an are sure because those have been given to us by the last Messenger of Allah Almighty, Muhammad (grace, glory, blessings and peace be upon Him), telling about them that those are True. And there is none in the world more Trustworthy than Him. 143a. Eight in (four) pairs: Of the sheep twain, and of the goats twain. Say: Hath He forbidden the two males or the two females, or that which the wombs of the two females contain? 142. Wa minal-‘an-‘aami hamuu-latanw-wa farshaa. Kuluu mimmaa razaqa-kumUllaahu wa laa tattabi-‘uu khutu-waatish-Shay-taan. ‘Innahuu lakum ‘aduw-wum-mubiin. 143a. Samaani-yata ‘azwaaj. Minaz-za’-nis-nayni wa minalma’-zis-nayn. Qul ‘aaaz-zakarayni harrama ‘amil-‘unsa-yayni ‘ammash-tamalat ‘alayhi ‘arhaa-mul-‘unsa-yayn. Hamuu-latun – (the cattle, which are bearer of the burden), grammatically this word is an adjective, which has been derived from hamal. Hamal means “to lift the burden”. Here it aims such animals, which are used as the means of conveyance, as transport like camels, donkeys and mules etc. Farshun – (those cattle which are of little height), literally farshun means bed-clothes, carpets etc. Here it aims “the cattle are of little height as the sheep and goats etc. because the height of these cattle is nearly close to the earth”. ‘Ammaa – actually this word is a collection of two words – ‘am and maa. After mixing the both words, it is “read and written” as ‘ammaa collectively. ‘am means “or” and maa means “which”. ‘Ish-timaalun – (to cling, to embrace, enwind), this word has been derived from shamal, which means “to cover anything, hiding inside”. ‘Ish-timaal means “to be wrapped around an object and hide it inside oneself” as a wearing shawl is wrapped around and covers the body. Here it has been described that “before the birth of a child, the womb of the female keeps it enwrapped inside”. That womb is called raham, plural of which is ‘arhaa-m.
Allah Almighty created the quadruped animals also for the humankind, out of which some animals are useful for conveying the load and bearing the burden. These types of animals are tall in height, whereas some animals like cattle have a little height. You should eat the meat of those cattle, of which is eaten and drink the milk of those animals, of which is drunk. Allah Almighty commanded His Messenger (grace, glory, blessings and peace be upon Him): Ask the idolaters! That which you make some cattle forbidden or legal to eat in the name of idols, tell about them! Wherever has Allah Almighty commanded to do so? There are eight in numbers of these cattle in (four) pairs as a whole including male and female; two of sheep, two of goats and remaining two pairs will come later. Tell Me (grace, glory, blessings and peace be upon Him) now: whether Allah Almighty has forbidden the male from them or female or those which their bellies contain? What the right you have to make any of those cattle forbidden or lawful to eat, if He has not commanded so? And He it is Who produceth gardens trellised and un-trellised, and the date-palm, and crops of divers flavor, and the olive and the pomegranate, like and unlike. 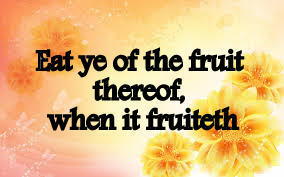 Eat ye of the fruit thereof when it fruiteth, and pay the due thereof upon the harvest day, and be not prodigal. Lo! Allah loveth not the prodigals- Wa Hu-wallazii ‘an-sha-‘a jannaa-tim-ma’-ruu-shaatinw-wa gayra ma’-ruu-shaatinw-wan-nakhla wazzar-‘a mukhtalifan ‘ukuluhuu waz-zay-tuuna war-rummaana mutashaabihanw-wa gayra muta-shaabih. Kuluu min- samari-hii ‘izaaa ‘asmara wa ‘aatuu haqqahuu yawma hasaadih. Wa laa tusrifuu. ‘InnaHuu laa yuhibbul-musrifiin. Ma’-ruu-shaatin – (trellised), this word is plural of ma’-ruu-shatah, which is (grammatically) the passive participle effeminate and has been derived from the word ‘Arsh. ‘Arsh means “to elevate, to uplift the creepers over wooden trellis as grapes plants are uplifted over the wooden frames duly fenced in the form of roof. Gayra ma’-ruu-shaatin are those creeping plants, which are not uplifted like the plants of melon, water melon etc. which spread on the ground or those plants which have stems (trees). Hasaadun – collecting the fruit and grains together in one place, when those ripen. Haqqun – here it aims – that portion of the production, which should be separated for the poor and needy people. The manifest blessings and favor of Allah Almighty have been mentioned in this verse. Every mankind can understand them with a little attention and from them, he can recognize Allah Almighty. Those people have been admonished in it, who reverence others leaving Him and separate the portion of their (idols and gods) names from their fruit, grains and food, whereas neither those liar gods and idols did produce anything and nor they can do so. They have forgotten Allah Almighty, Who created everything from the earth for human beings. It is commanded: If you wish to know Allah Almighty, in that case; you should see the gardens around you, in which creeping plants of the grapes have been uplifted over high wooden frames like a roof and the clusters of grapes have been hanging into them. Observe those creepers, which have been spreading on the ground themselves. Look at the trees of date-palms and crops, in which different kinds of fruit and grains are produced. Behold the plants of olive and pomegranate, which are alike and unlike in shape and taste from one another. Different in taste – as sweet, insipid, citrus, non-citrus, sour and sour-sweet eatable things are produced by Allah Almighty. Eat these things fondly, when these are ready after ripening. Moreover, keep the portion from these things separate for the poor and needy on the day of cutting and picking the grain and fruit, but bear it in mind that needless, nothing is destroyed. Allah Almighty does not like the prodigals and those who cross the limits.